elainacom – my life and things that make me happy. mostly food. 6 months. There is a 6 month countdown until I turn 30. 30! August 26th is the big day. Last week during a work event, a coworker suggested I do 30 things before I turn 30. I laughed it off. Then today in the shower it came back to me but this time I decided it was an awesome idea. And so this list was born! I just started a new job a month ago, so anything that is time consuming or requires traveling more than a few hours away is out. But, Cleveland is a great city and I still came up with plenty of options! Nothing crazy unobtainable, but need to keep up on planning and documenting! This corned beef sandwich is bigger than your face. No joke. I took a half day from work the other day for no better reason than I wanted this corned beef sandwich. I left work, picked up my cousin and headed downtown to Slyman’s. Located on the corner of St. Clair and E 31st, with plenty of street parking and a large free lot to park in, it’s a super easy find. We both ordered a reuben and shared a plate of gravy fries. The sandwich is amazing. The corned beef is juicy, tender and full of flavor. The fact that it was a reuben goes almost unnoticed since the ratio of cheese and sauerkraut to meat is way off, but I am ok with this. 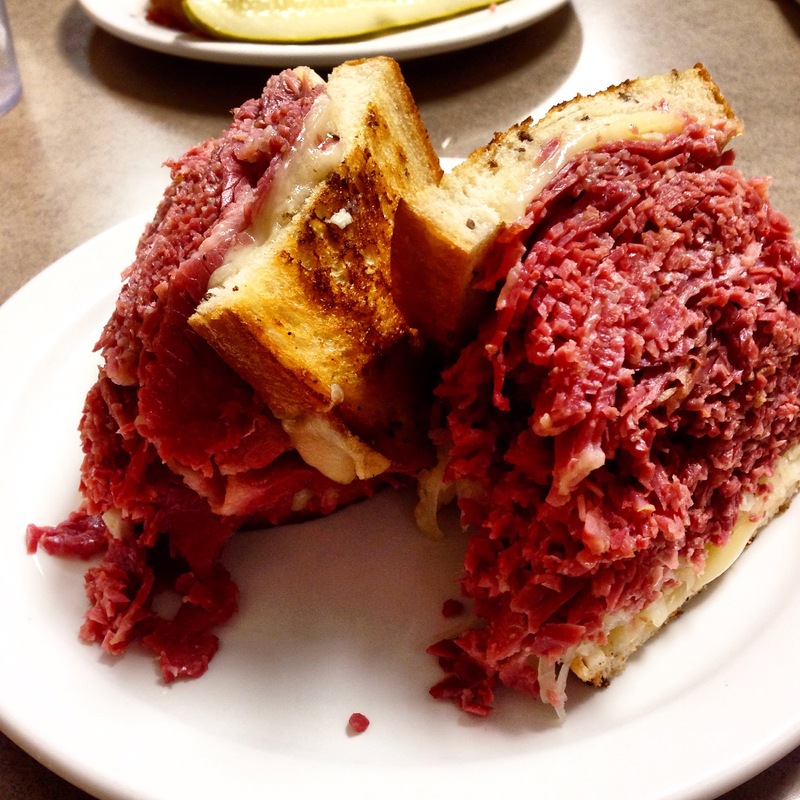 I mostly order the reuben instead of the plain corned beef sandwich because I like the grilled bread. I guess that I could ask for it that way, but I don’t like asking for special orders at busy places. You get to add your own thousand island dressing to your sandwich from a squirt bottle that every table comes equipped with. I love this part. I like a lot of sauce on everything and hate sounding like a heffer when I ask for extra x 4. I can’t even come close to eating the whole thing so I pull off about 60% of the meat and save it for home. Corned beef hash for breakfast??! OKAY, if I must! So dramatic. The gravy fries were out of this world. Could I pack anymore salt into one meal? Probably not! Don’t judge. You should do the same. The gravy was beefy and perfect. I don’t eat gravy fries often, but these were probably the best I’ve had in a long time. With only breakfast and lunch hours, I foresee myself taking another half day in the future! You should too. 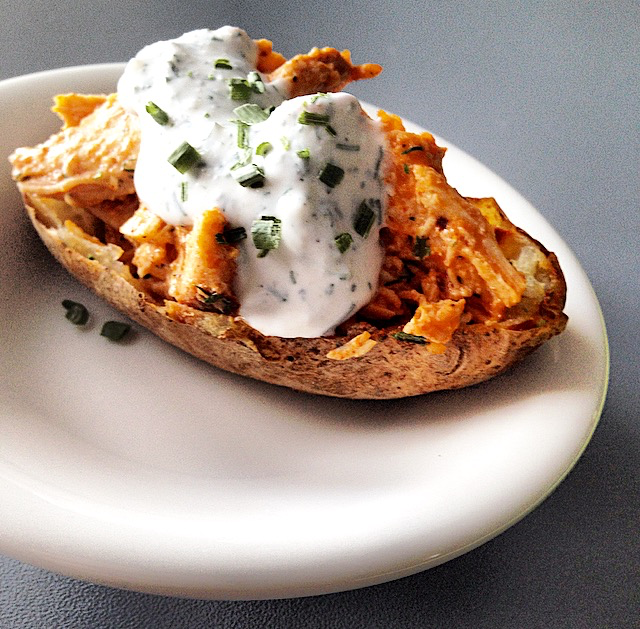 buffalo chicken ranch potato skins. Potato skins. A bar food favorite! Buffalo chicken. Best flavor of chicken. Let’s mix them, ok?! I live alone and didn’t want to eat these for 18 days. Therefor, I only made 4 skins, you can easily double, triple, quadruple (etc.) this recipe for your serving needs. 2. Put empty skins back in oven on 400 degrees for 7-10 minutes to crisp up a little. 3. Mix together warm chicken, hot sauce, and ranch. 4. Stuff inside your skins with 1/4 of the mixture each. Garnish with whatever you’d like… chives, ranch, cheese, bacon, e.) all of the above. *To make some dairy free ranch, I mixed 1 Cup of Tofutti Sour Cream with 2 Tablespoons of a homemade ranch seasoning. I mix these spices together and keep in a glass jar then add it to EVERYTHING. Because, ranch makes life better!